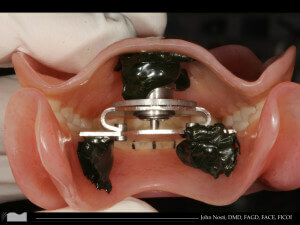 Dentures can pose many difficulties to dentists, who may find the process involves too much guesswork and frustration. In order to improve your experience in all aspects of the treatment process, I’ve put together a simple guide that will help you avoid ill-fitting dentures, coordinate with the laboratory, and utilize the Gothic arch tracer. Take advantage of the Gothic arch tracer to achieve an improved denture fit, reduce later adjustments, and save postoperative time in the long run. This staple of restorative dentistry is the best method for obtaining consistency and accuracy with the occlusion. The Gothic arch tracer ensures occlusal harmony in denture construction, enabling consistency and accuracy capturing occlusal vertical dimension and centric relation. This will lead to better patient satisfaction and laboratory communication. Record an arbitrary bite relationship during the first appointment with the Centric Tray. (Line with gauze to facilitate removal of the putty once the lab has mounted the study models). Send to laboratory for mounting the patient’s maxillary and mandibular Wax Rims parallel to one another. (This enables the lab to mount the Gothic arch tracer components perpendicular to one another). Hand mix the putty and place inside the maxillary and mandibular components of the tray. Place the tray in the patient’s mouth while asking them to close to a reasonable proximity of the existing denture vertical dimension of occlusion. Remove the impression once the putty is set and send to the lab, along with the rest of the smile design info. Ask the lab to fabricate a second set of base plates with recorder mounted on it without the wax rims. Using the Gothic arch tracer should only take about 10 minutes once you get things back from the lab. Either paint the strike plate with magic marker or use articulating paper to mark it. (Depending on the manufacturer’s instructions). Instruct the patient to slide the mandible forward, backward, and into left and right lateral excursions. The marks should resemble an arrow, with the tip of the arrow determining the centric relation position. Place the center of the centric pin receiver over the point of the arrow. Use adhesive to bring the pin receiver to the strike plate. Place the base plate back in the patient’s mouth and guide them until the pin goes into the hole in the centric receiver. Secure the baseplate together using a hard bite registration material. To ensure that the laboratory-fabricated dentures are precise and accurate, use Gothic arch tracers to equilibrate and confirm the centric relation and vertical dimension of occlusion. 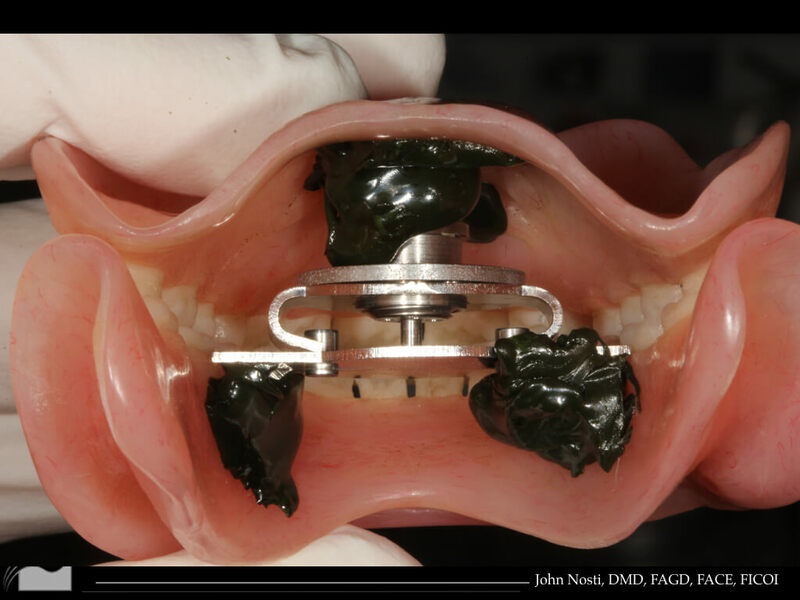 This can be done by having the technician mount the maxillary cast and use a facebow record. The mandibular cast can be mounted to the maxillary cast using the arch tracings. Balanced denture occlusion is achieved when proper mounting enables the intraoral tracer to be used as a central bearing device. Two of the key worries that patients have when approaching their dentist about dentures are the comfort and esthetic appearance of the removable prosthetic. Instead of considering denture treatment as something to be avoided, take advantage of this opportunity to solve the needs of the growing number of edentulous patients in the United States. Great technique. The course with Dr. Massad is excellent, plus, he is a wonderful human being. http://www.joemassad.com/dentist/home/ . Same with Dr. Jack Turbyfill: http://www.turbyfillseminars.com/ . Their courses are the ultimate.